Nations are beginning to look inward. What will be the end result? Fences are making a major comeback in America, Europe, Asia and the rest of the globe. Some, like Donald Trump’s proposed fence along the United States-Mexico border, are literal. Others, like China’s currency manipulation, are figurative. But they all serve a common purpose: preserving national interests and deterring domestic threats. These fences evidence a major global trend: the rise of nationalism. They manifest a growing shift away from globalization, and toward self-interest. Nations are focusing more on protecting their own economies, their own manufacturing industries, their own people and their own cultures—because of uncertain and unstable global socioeconomic conditions. Nationalism and globalization are mutually exclusive trends. Both cannot exist at the same time. Today’s trends indicate that nationalism is coming up on top. For thousands of years, global connectivity was limited. In the area of travel, people were limited to their villages and cities. It was not until the Age of Discovery that global travel expanded. But even then, it was limited to only a select few. In more modern times, however, humans, ideas, technologies, products, food, animals, art, music, religions traveled the world in hours and seconds. Globalization—greater international integration and cooperation—became the new magic potion that would supposedly solve mankind’s problems. The idea is, the more that countries became intertwined and interconnected, the more incentive there is to cooperate and get along. More and more problems would be solved as nations work together. Many have believed that globalization, and our interconnected world, would result in a decline in the nation-state, a decline in tension and conflict, and a rise in cooperation. There would be fewer disagreements between nations and peoples because nations would be more reliant on other nations. In the thesis of his 1910 book The Great Illusion, Nobel Peace Prize Laureate Norman Angell said that war between industrialized countries is futile and unlikely because the countries were too economically interdependent. Two world wars proved him wrong! As bad news is mounting concerning the health of the world trade system, one has to wonder: Have we reached a peak in the globalization process? Is there still an appetite to continue to promote international integration via the expansion of trade? … Or have the tides changed so that we are going to witness a retreat from globalization in parallel with the observed slowdown of international trade? Professor Braga listed a series of multilateral trade agreements that are bogging down and even failing. The faltering global economy is compelling countries to work harder to protect and advance their own trade interests. There is less political will among world leaders to collaborate, integrate and work together. And it’s a global trend. Consider the trends in the following regions and nations. Hungary is building a 110-mile, 13-foot-high fence along its border with Serbia. Hungary has been receiving tens of thousands of migrants from the Middle East and North Africa. The nation is overwhelmed by them, and it feels the need to act to protect itself. Bulgaria has a 50-mile-long steel fence along its border with Turkey. It’s adding another 10 to 15 miles lined with razor wire and monitored by armed security guards. Macedonia is also facing a similar migrant crisis. 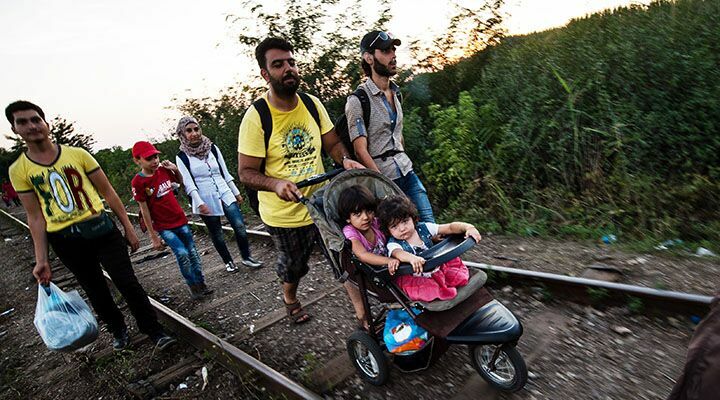 More than 3,000 migrants cross into Macedonia every day. Across Europe in recent years we have seen a drastic increase in the popularity of nationalist political parties. Some of these parties espouse some pretty extreme views; some support Nazism; some want to confront Islam and get rid of Muslims; some want to toss out the migrants. But they all want to protect and further the national interests of their countries. Russian President Vladimir Putin invaded Ukraine and annexed Crimea—all in an effort to augment and expand the Russian nation. Moscow occasionally sends its military aircraft into American and British airspace—all in a show of Russian strength. The former Soviet Republic is constantly upgrading its military, acquiring more fighter jets, ballistic missiles, surveillance satellites and warships. Most recently, Putin has embarked upon a nationwide purge of food imported from certain foreign nations, mainly European nations. Last year Putin put an embargo on food imported from Western nations. He made it illegal for Russian companies to import food from the West. The country is transforming into a nationalist fortress, yet many Western leaders are apparently content to ignore the potentially dangerous implications. After a decade of reaping the benefits of a soft-power offensive, China’s “peaceful rise” took an abrupt turn in the late 2000s. The country that emerged from a unique confluence of events beginning in 2008 has proven a more assertive, authoritarian and nationalistic rising power. We see evidence of Chinese nationalism rising almost daily. Beijing is literally building islands in the South China Sea. One of these newly created islands is 220 miles from the Philippines—and more than 600 miles from China! It is expanding its military and parading its weapons before the world. In recent weeks, China devalued its currency by at least 3 percent to invigorate its manufacturing industry and export market. A cheaper yuan makes Chinese goods cheaper. China’s actions proved it has no interest in playing fair, in fostering a community spirit, in collaborating and cooperating. The message coming from Beijing is, We don’t care what happens to the rest of the world. We are saving ourselves! China comes first! American authorities thought Beijing would be so intertwined with the global order that it wouldn’t do anything to destabilize that order, as doing so would only hurt its own interests. But they were wrong! Some people are starting to realize that globalization is not making the world safer, and it’s certainly not improving relations with China. China is taking care of self! In Britain, Nigel Farage and the United Kingdom Independence Party remain popular despite setbacks in national elections earlier this year. Farage believes in a strong, independent Britain. He despises the European Union because it’s destroying Britain’s laws, values, culture and lifestyle. He’s deeply concerned about immigration for exactly the same reason. Farage wants to “make Britain great again!” And his popularity shows that there are a lot of people who agree with him. Donald Trump, the front-runner in the race to become the Republican nominee for president, is America’s version of Nigel Farage. Like Farage, Trump is candid, brave and totally fearless. He doesn’t worry too much about political correctness. He doesn’t mind offending other nations or peoples. Trump’s message has a distinct nationalist tone to it. His campaign slogan is “Make America great again!” The central question for Trump on almost every issue is: What is best for America? When Trump and people like him look at the world—at China, at Russia, at Latin and South America, at Japan—they see these nations increasingly moving away from globalization and increasingly putting national interests first. Donald Trump knows that if America is going to survive, it needs to start playing the game the same way other nations are! Like some nations in Europe, Donald Trump wants to build a fence too—the great wall of Mexico that will be 2,000 miles long. Yet nationalist sentiment is increasing across the planet. The more extreme that economic conditions become, the harder that nations will work to take care of their own. What does this global rise of nationalism mean—for the world and for you? If this nationalist trend continues, there will be more tensions, more rivalries, more disputes, more conflicts and, ultimately, more wars between countries and regions. As conditions worsen—especially with the global economy—expect less cooperation, less collaboration and more tension and conflict!